Waves are everywhere. They are seen at all scales, from quantum to cosmological, and in many natural and astrophysical contexts. While they are produced by a vast variety of physical forces, they have a common core of mathematical descriptions. They often occur in random ensembles such as on a sea surface stirred by a recent storm. The Wave Turbulence description addresses the long time, chaotic behaviours of a sea of weakly coupled dispersive wavetrains in the presence of sources and sinks. The subject is remarkably rich. It has a wealth of applications from oceans to atmospheres, from the solar wind to semiconductor lasers. It provides a most tractable example of a non-equilibrium statistical system. It has undergone a recent resurgence driven by its enormous applications potential, its role as a natural paradigm for non-equilibrium systems and by some new discoveries connected with intermittency and the random occurrence of coherent events. Our scientific ambition is to break through the traditional paradigm of the existing theory by addressing new fundamental problems motivated by important environmental applications. This will provide stimulus and training to the PhD students and postdocs by exposing them to the exciting developments at the cutting edge of discovery. The trainees will acquire highly transferable skills (mathematical modelling, scientific computing). The applications include wind-wave modelling, wave weather forecasting, slick dispersion by waves and the sea spray formation. This project is a natural continuation of the past and ongoing activities at Warwick Maths in collaboration with Vladimir Zakharov (Landau Institute and Arizona), Alan Newell (Arizona), Colm Connaughton (ENS, Paris), Yuri Lvov (RPI, USA), Laura Biven (Max Plank Institute). Interstellar scintillation (ISS) is defined as the fluctuations in amplitude and phase of radio waves emitted by objects like pulsars. Origin of ISS is found in the scattering of radio waves by electron density fluctuations in the ionized interstellar medium whose power law spectrum extends from scales of the order of 1.e9m to the scale of the interstellar clouds itself (1.e17m). It is often assumed that the origin of the power law spectrum is due to turbulence but up to now there is no theory of interstellar turbulence. The ubiquitous presence of an interstellar magnetic field and its important dynamical role suggest that such a theory could be based on MHD equations. On the other hand, the anisotropic scattering of radio waves suggests that the electron density fluctuations are preferentially perpendicular to the mean magnetic field and therefore that a theory of interstellar turbulence could be built rigorously in the framework of wave turbulence. Basically the essence of wave turbulence is the statistical study of large ensembles of weakly interacting waves, like Alfven waves for incompressible MHD, via a systematic asymptotic expansion in powers of small nonlinearity. This approach leads to the derivation of ``kinetic equations'' for quantities like the wave energy whose exact stationary solutions in power laws can be obtained. In the case of Alfven waves, and for three-wave processes, a k^(-2) energy spectrum has been found revealing therefore a fundamental difference with strong MHD turbulence. Another direction in the study of Astrophysical Turbulence at Warwick has to do with the turbulent Magnetic Dynamo, - a mechanism which is though to have led to the Galactic magnetic fields. This project is based on the past and ongoing activity at Warwick Maths in collaboration with Sebastien Galtier (IAS, France), Annick Pouquet (NCAR, USA) and Alan Newell (Arizona), Gregory Falkovich (Weizmann, Izrael). 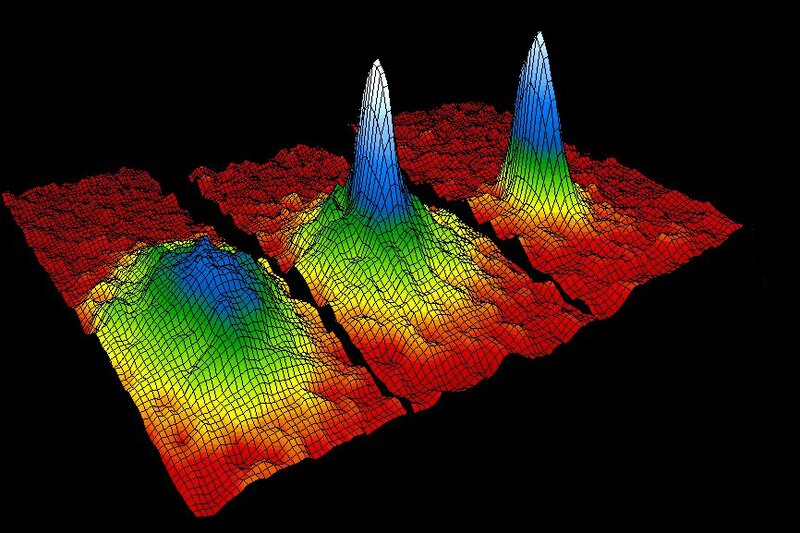 Bose-Einstein condensate (BEC) was perdicted in 1924 but it was not until 1995 that it was discovered experimentally at the JILA lab in Boulder Colorado. This work was awarded by the 2001 Nobel Prize in physics and it lead to a resurgence of the theoretical studies of the BEC phenomenon. Basically, BEC is a state of super-cold matter where most of the gas atoms occupy the lowest possible energy level (see the picture insert which shows the JILA's experimental result about the energy concentration near the zero-momentum ground state). It is common in the low-temperature physics to describe gases by the thermodynamic theory in terms of temperatures and chemical potentials. However, this description becomes invalid when the system is far from equilibrium, and this turns out to be the case during the Bose condensation. Thermodynamic description here would be as un-realistic as a description of waterfalls using a theory developed for lakes. On the other hand, the fluxes of conserved quantities through scales, i.e. the energy and the particle cascades, turn out to be more fundamental characteristics that the temperature and the chemical potential. This is another physical example where Wave Turbulence (WT) can be used to describe such cascades. But the dynamics in BEC appears to be too rich to be described by WT in its classical form, and it needs to be developed further to account for the coherent structures forming in the system: collapsing filaments, vortices and solitons. These coherent structures cause intermittent "bursts" in BEC turbulence, a phenomenon which needs to be carefully studied. The Warwick group's study of BEC turbulence has involved collaboration with Vladimir Zakharov (Landau Institute and Warwick), Alan Newell (Arizona) and Yuri Lvov (RPI). There is plenty more to be done, especially in describing WT in presence of coherent structures and turbulence intermittency. Navier-Stokes turbulence, or simply turbulence in water and air, is the subject of study of a vast number of researchers in physics, mathematics and engineering. Some properties of turbulence are well established, for example persistent occurence of the energy cascade through scales or the exact form of the third order velocity correlator. However, there is much more about the NS turbulence that is not known, and to date there is no systematic statistical description of this phenomenon. Direct numerical simulations (DNS) using powerful modern computers come as great help in predicting turbulence. However, even the most powerful computers cannot resolve motion at small scales which contains nearly 90% of the turbulence energy in important atmospheric and oceanic applications and this situation is not likely to get better in near future solely due to increases in the computational power. Not everything can be done by brute force. It is therefore vitally important to develop "smart" turbulence models which could be used for predicting properties of turbulence at the scales which cannot be resolved by DNS. Developing such "subgrid scale" models was the subject of research at Warwick in collaboration with Berengere Dubrulle (CEA, France) and Jean-Philipe Laval (ENS, Lille). These models were "smart" because they exploited the basic knowledge about the 2D turbulence that the energy gets accumulated in the large-scale vortices (see the picture insert) which will influence the small scales in an essential way by distorting them. Such an interaction of widely separated scales is also important for explaining intermittency of 3D turbulence. However, the work on developing the 3D subgrid models is yet to be done and this could be an excelent opportunity for a new PhD student.